Bree Ray of Las Vegas, Nevada, completes Saturday’s 3rd Tortola Torture in a Women’s record, 4 hours, 58 minutes and 16 seconds. When her friend Jen Shelton got injured while skiing in Italy, Bree Ray of Las Vegas, Nevada, had one simple goal in Saturday’s3rd Tortola Torture. Ray not only demolished the Women’s Division course record, but finished 36 minutes ahead of Virgin Gorda’s Vincent Fournier, her closest male pursuer, to dominate the evetn and in the process, became the second person completing the 33.4 miles challenging course in under five hours. Ray covered the course from Road Town, around Steel Point, up Windy Hill to Sage Mountain, down to Brewers Bay, over the Ridge Road to Baslam Ghut, then around Little Mountain and with a finish at Loose Mongoose on Beef Island, in 4 hours, 58.11 seconds. The American finished just behind the Three de Hard Way’s relay team of Julius Farley, Reuben Stoby and Rosmond Johnson’s 4:58.06, a new relay record. Fournier was the second individual overall in 5 hours 35 minutes and 14 seconds while St. Croix’s Mike Klein was third in 5:43.22. 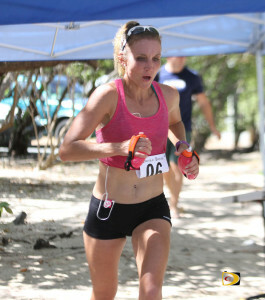 Maria Mays, 15th overall, was the first Virgin Islands woman in 6:05.21. Fournier said he was trying to improve on last year’s 5 hours 24 minutes and 03 seconds time. Stoby said his team Three The Hard Way knew they couldn’t do it individually but wanted to support the event and came together and were surprised to break the 5:03.24 course record.